This replay recording (and the BIMx file download) is available to all ARCHICAD USER members at the Silver Level and above. It appears that you are not currently logged in. Please LOGIN to view the recording of Tim Ball's inspiring presentation. Note that recordings of past webinars are only available to SILVER LEVEL members (and above). 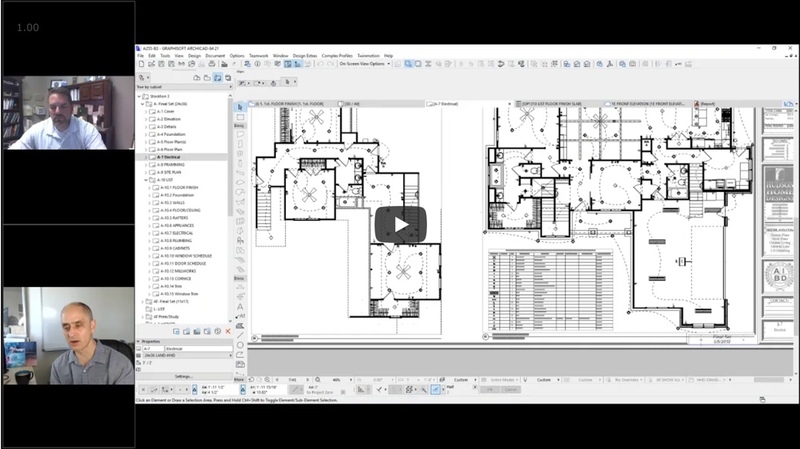 "Dialing In The ARCHICAD Template"
In May 2018, I interviewed Chip Hudson, a veteran ARCHICAD USER who has created one of the most highly developed and refined templates I've seen. It's truly a treat to explore his project files to see how everything is dialed in for speed and consistency along with active scheduling and some innovative quantity take-offs. I first became acquainted with Chip when I saw a presentation by Josh Bone of Graphisoft at a BIM Conference a few years ago. Josh showed how quickly and easily a kitchen could be assembled from the kit of parts Chip had set up in his template (see screenshot below). It's the same idea as the Interactive Legends in MasterTemplate, applied in a focused manner to this design area. I was impressed, and got permission from Chip to incorporate the concept into the next iteration of MasterTemplate, along with a few other pieces of his template. In preparation for the webinar, I spent an hour with Chip going through one of his projects, and saw even more cool tricks that he's developed. This session is an eye-opener for ARCHICAD USERs who want to optimize their workflow, increase productivity and create working drawings with less effort and higher quality. I love it when people like Chip are so willing to share their knowledge with the ARCHICAD community. BONUS - Silver and Gold Level Members Only: Chip shares some parts of his template, including smart library components he's developed. Session Recording - 2 hours 25 minutes full of tips and great ideas for you to use in your project template! Sign up for SILVER membership and you'll be able to watch this inspiring video!